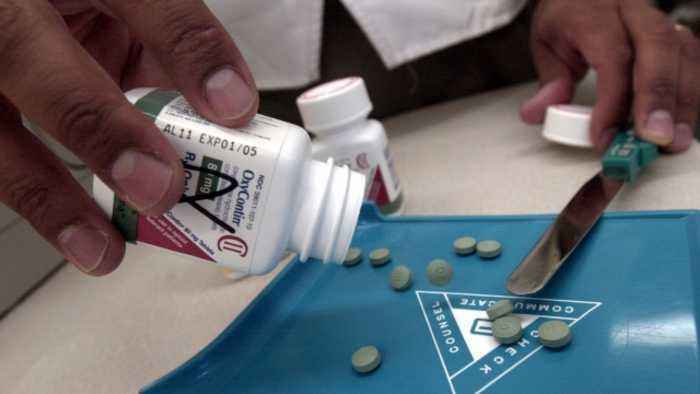 Federal prosecutors are charging 60 people, 53 of them licensed health professionals , with illegally prescribing and distributing opioids and other narcotics and participating in "health care fraud schemes." The Justice Department announced the charges Wednesday. The agency said the enforcement actions involve dozens of doctors, pharmacists, nurse practitioners and other licensed medical professionals. The charges involve over 350,000 prescriptions for controlled substances and over 32 million pills. The so-called "takedown" stems from the Appalachian Regional Prescription Opioid Strike Force. It was formed last fall to help areas with high numbers of opioid-related overdoses and deaths. The group covers several districts in five states. The strike force started work in December, leading to the charges announced Wednesday. NPR reports the APRO strike force used traditional law enforcement methods in its investigations, like search warrants and surveillance. The CDC reports that about 130 Americans die every day from opioid overdoses.